Running Away to Home : Our Family's Journey to Croatia in Search of Who We Are, Where We Came From, and What Really Matters, by Jennifer Wilson, is February's pick for the Reading to Know online bookclub. Carrie from With All That I've Been Given** will be leading the discussion on this book and so you'll hear from her in one week's time as to what she thought of it. This month I managed to get to the read before the deadline and so I'm here to share my thoughts on this one! I have to confess that I was quite suspicious of this book. I trust the other Carrie though and so I was willing to give it a whirl. I didn't expect to like it much, especially since Carrie gave the warning that there is quite a bit of language scattered throughout the story (she didn't realize that when she picked the book.) 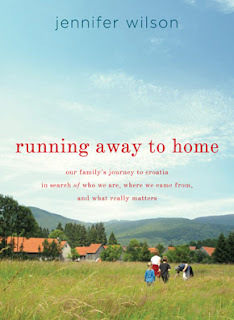 Expecting to have to force myself through Jennifer Wilson's story, I opened the pages of Running Away to Home and found myself lost in Croatia and loving the journey. As Carrie forewarned us, there is a hefty bit of language and quite a bit of drinking. (The culture over there drinks a lot of alcohol, apparently.) Since I'm not against alcoholic consumption on its face, this aspect didn't really bother me very much. What I mean is, I wasn't bothered that the people enjoyed a good drink or two. I am, however, adamantly opposed to the idea of drinking in excess, becoming drunk or losing control of one's faculties and that does happen quite a bit in this book. I mention this because I know that these two things combined will cause the conservative reader to shy away from this tale. I can't say that I would blame them. I did choose to ignore the foul language though because I thought Wilson had a lot of interesting things to say about her family's journey to Croatia. 3. To expose their children to other parts of the world and teach them to travel. All of these things were accomplished to some degree or another. The thing which makes this book so very intriguing to me, of course, is their desire to escape America's commercialized, fast-paced society. They wanted to slow down and take time to be a family. Their savings allowed them to take one year off from work and do this and so they took advantage of the opportunity. Then I left a chicken on the stove and forgot about it. In a "painfully easy" sort of way, God allowed for us to be smoked out the large majority of our possessions. We're in temporary housing with a handful of items that have always been ours. Our house is under wraps, with things being cleaned and tossed. We don't know what we're going to have when we walk back through the doors. We have no idea what the future holds for any of it. And you know what? I'm glad!!!! We didn't have the courage to say goodbye to stuff all by ourselves. It still is rather painful to think about some items which have been lost (and some which we really hope can be fairly easily cleaned or replaced!) We've moved into this new situation with less and I've discovered a few things. 1. When you have less stuff, there's less to clean and care for. Clean-up of this entire temporary housing takes all of 30 minutes. Entirely. Every item put away, every bed made, dishes washed, etc. It's all done in half an hour. The entire house can be cleaned on a daily basis because most every drawer and cabinet is empty and there is only one basket of toys. 2. On Sunday, we didn't have stuff that we had to keep up with or tend to or set into position to run smoothly in the upcoming week. We could go to church and felt completely free to stay afterwards and fellowship and eat lunch with others. Why not? There was nothing pressing to run home to! (Except naps. Naps are always worth coming home too, still.) It was truly a day of peaceful rest, sans stuff. In a way, we're currently in our own Croatia - away from everything that is familiar and away from everything that demands constant attention. We're just here. It's ok to sit quietly. It's ok to read books. It's ok to play a few games. It's also ok to not have things perfectly arranged as we are used to. Dishes don't have to match. Matching dishes do not create happy atmospheres. People do. People. Fellowship. Slow, quiet moments to enjoy both things in. That's the beauty in this life right now. And so I really don't mind if we have to stay in this temporary housing for a long, long time because I want to make sure I learn and remember how peaceful it is to own practically nothing. That is also true and we need to be realistic. Our quirks and sinful habits came with us. (Those take a different kind of smoking out!) But we're left with time to contemplate and deal with it. We can't run away and hope that a big life change and shake up will solve all of our problems. They still lurk in the shadows, if they aren't outright staring at us in the face. Trials and changes aren't meant to 'take us away from it all'; rather they refine us and give us perspective. And that's what I hope we learn from our time away from our home. I hope we learn gratitude. I hope we remember that stuff not only just doesn't matter, but that it 'ties you down to so many lesser things' as Steven Curtis Chapman has sung. Jennifer Wilson learned that for her family and she shares their adventures in a very interesting way. I identified with a great deal of it, although not as a world traveler. Rather, I and my family are on a spiritual journey right in the town where we live. Again, I am grateful. I just want to hang on to this. In the meantime, if you think you can handle it, I highly recommend Running Away to Home and I'm glad Carrie picked it. You still have this week to read it and it reads at a fast pace. 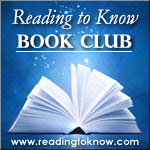 (I'll be posting the wrap-up post for this month's book club on Friday.) Curious to hear what everyone else who has had a chance to read it thinks of it! **If you click over to the other Carrie's blog you will discover that she is pregnant with her third child and is experiencing some complications in the pregnancy which have landed her in the hospital for the duration of her pregnancy. If you would please pray for Carrie's health and safety, as well as for her new baby's, that would be most appreciated!! I'm enjoying this one as well. I do have to comment though, that the reason they are able to "simplify" is that they can take an ENTIRE YEAR off of work. I sure as anything could simplify quite a bit if I could do that. It also seems as if plenty of the Croatian men spend most of their time sitting around too. Someone must support them, but who? The women, I guess? Again, this shouldn't distract from the fact that the book is really enjoyable - it's a fun story. The author really does get to live her fantasy for a year. If I can't actually do it, at least I can read about it. Glad you read along. I enjoyed your thoughts and the quotes you picked, especially in light of your current situation. Boy, am I thankful I picked February and sent everything your way before our own emergency! Thanks for praying. It IS funny how close this is to your situation. I just started it but I think I'll probably like it. And I'll be able to actually finish it. Very enjoyable thoughts on what sounds like a good book! I had to pass this time...but may read in the future. I enjoyed it, especially since my great-grandpa (who I know almost nothing about) was from Croatia. Don't have any deap thoughts about it, but I was glad for the chance to read a book I wouldn't of picked up off the shelf myself. Perhaps I'm forgetting, but I didn't find the swearing too terrible...and I'm fairly picky about that. Loved your thoughts on this book - I was nodding and mm-hmm-ing and agreeing with all you said. : ) Having spent 2 weeks in Croatia on a mission trip, I was having flashbacks to the people there and remembering so many of the situations that the author encountered on her journey (though I staying in an urban city and she was very, very rural). I guess I need to get cracking on my review as well! This doesn't sound like one I would enjoy reading, but I can appreciate the longing for simplicity. I can remember when I was a kid, after dinner in the evenings all the kids would be outdoors playing and all the adults would bring out lawn chairs, watch the kids, and visit with each other. Even though part of me misses that, part of me is restless just thinking about it. I'm so used to doing two things at once -- I don't know if that's good or bad -- "just sitting" makes me restless. I read what I did at the first part of January(I think), and I'm still pondering some of the things that the author said. Love your perspective on the book, Carrie, and your new life situation. It's wonderful that you can see the blessing in disguise! Despite my early intentions, I'm not reading this one because I couldn't get it at any of my local libraries, and I didn't want to buy it based on the early thoughts and reviews I read about it. It sounds like an interesting story, though. My library didn't have it and I didn't feel like spending the money on it, so I requested it and it STILL isn't in. I was thinking to just skip this one, but your review is making me want to read it! :) I have to admit I found it rather ironic to read a book about moving AWAY from IA when I just moved TO IA, chuckle. But I love your reflections, particularly about the way God uses experiences in our lives to refine us and the way you are choosing to appreciate your current simplification!! I find this intriguing. My husband's sister married the son of a Croatian immigrant. They went back to the country to meet the family a few summers ago. One of my favorite pictures from this trip is the family eating at a table in the middle of a meadow. It looks very rustic except for the Coke bottles on the table! This seems like a perfect gift book for them...except they don't read books. Ever. Yes, I'm very intrigued. Thank you for the review. Carrie, this is my favorite post of yours! Thank you for beautifully and naturally interweaving your own life experiences with your reaction to this book. Loved your thoughts.